The new BMW M5 was just revealed but the high-performance midsize sedan will surely write a new page in BMW’s books. Not only because it comes with all-wheel drive for the time in the history of the M5, but also because tuners will have a field day trying to take it to a new level. Working in their favor is the fact that under the hood of the F90 M5 sits and hums patiently a reworked version of the S63 4.4-liter V8 instead of a brand new engine. Tuners like Manhart Performance know that very well and can’t wait to get to work on it. At least that’s what a teaser published by the company last week seems to imply, showing us how a MH5 700 model could look like after they are done with it. 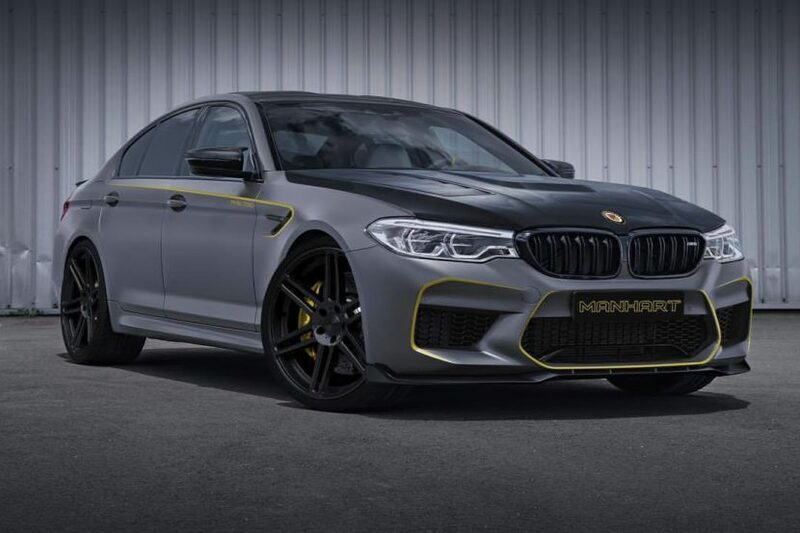 The rendering follows the usual Manhart design cues, including their trademark lightweight wheels, all blacked out, yellow brake calipers hiding behind them, a front lip attached to the bumper made out of carbon fiber for sure as well as yellow accents on the front air intakes and side character lines. The MH5 700 logo is done in the same color on the front doors. Last but not least we get a look at how a carbon fiber vented hood could look like on the new M5 once Manhart is done with it. And while everything definitely looks nice, it’s the enhanced performance we’re most interested in. Since the engine is still an S63 with added improvements, the Manhart team shouldn’t have a hard time taking this thing up to 700 HP, at least at first. Since the M5 will have 600 HP to begin with, that’s a small power increase overall. However, the tuner also showed cars with more than 800 HP and 1,000 Nm (773 lb-ft) of torque recently and we have no doubt that the F90 M5 will most likely get to those levels sooner rather than later. Now it’s all a matter of time until we get to see this thing become reality.